To me, teaching and learning are both the two sides of the same coin. For centuries teachers have shared their knowledge with students creating networks but today the idea of collaboration among colleagues and students is the key to understand the new models of teaching and learning. We are immersed in a technological age where all kind of reading formats are part of our daily life. Internet and multimedia, transmedia, as well as multimodality have radically changed the way we perceive reality and how we understand fiction. "Experimenting with new media stimulates new habits of mind and enhanced cultures of collegiality. Future faculty members in the modern languages and literatures will require flexible and improvisational habits and collaborative skills to bring their scholarship to fruition. In this environment, the pleasures of deep reading will be challenged by and joined with the new pleasures of distributed readings across networks, as N. Katherine Hayles has suggested. Requiring the dissertation monograph as it is now defined (as a singular and solitary venture) will leave students unprepared for the increasingly collaborative scholarly world of the future and for new ventures in collaborative public scholarship, which seeks to link those in the academy to intellectuals and communities outside it." My goal was to facilitate digital literacy for academic purposes to students and the idea came from the need to adopt new formats in the way we exchange knowledge. This was how The Littera Project arose as an educational project developed in collaboration with my colleague Prof. Alvaro Llosa Sanz -today teaching at University of Oslo, Norway- and (again), the Department of Hispanic Studies at University of Szeged, Hungary. Thanks to this collaboration I, along with Alvaro Llosa Sanz, had the opportunity to develop a fruitful bunch of undergraduate as well as graduate courses where new methodologies, didactics and tools were in play during the academic year of 2010-2011. From 2012 until 2015 The Littera Project consolidated a solid program of courses with the participation of new institutions that gave us the chance to keep working on this joyful educational adventure. Syracuse University and Hobart and William Smith Colleges hosted The Littera Project, so we could extend our vision. Opening the project to more collaborators was a matter of time. Following the principle of connecting our students as most as possible to an authentic and immersive framework lead us to increase their interaction beyond the institutional space. This was how we stablished specific or regular collaborations with more professors but also with writers, musicians, even with travel bloggers or business people who had a wide range of experiences, all of them useful to show our students to think Spanish as something beyond the pure and raw idea of language, literature and culture. Students had the chance to live Spanish as a global entity linking their personal and professional interests with the entire Hispanic world. Regarding my research, I also participate in academic nets such as national and international professional associations (Humanidades Digitales HIspánicas, ALDEEU, ANPE). I am in touch with colleagues in order to collaborate in colloquia and multiple author academic publications. Students benefit from my scholarly readings and meetings. dIn a student-centered class, collaboration was the main concept that provided me the dynamics to develop the class itself. I worked with my students managing the information found and shared by them as well as the roles they developed in groups or as individuals. I also organized the content they needed to jump into the search of contrastive data in order to compare materials and drove them into the search of reliable sources. Additionally, I provided the appropriate questions to spark their critical mind and their ability to express an opinion following the academic procedures. We realized how a team can progress in a natural way when learning a foreign language and its literature and culture if there are strong bounds outside and inside of it among its members. Therefore, students were able to learn how to use digital tools for academic purposes at the same time they were covering a specific syllabus on Spanish literature. 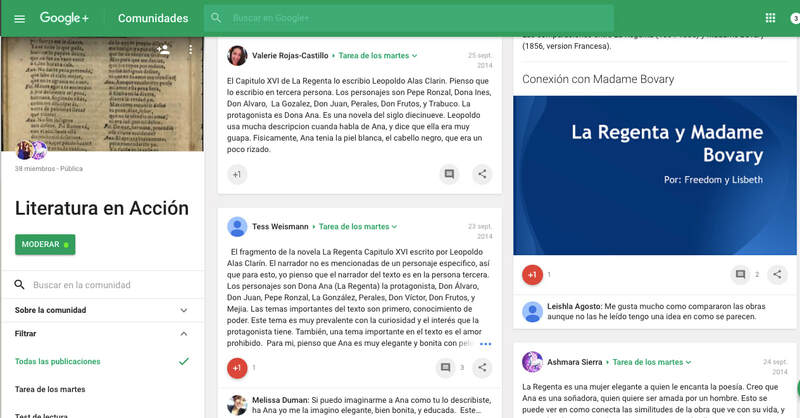 ​​They were able to develop individual projects online (papers on Spanish Literature in the shape of a website), collaborative power point presentations as well as collective papers written in collaboration with their peers and the teacher herself. As a team we discovered a whole new way of working together, deciding the calendar of each activity, discussing how to manage and solve problems during the process of completing an exercise or a task, giving feedback to each other. As teacher I learned from my students how this activity can be improved, how that other should be rethink in order to get a more flexible result, so the student can focus on this particular topic or that specific grammar point. Along with the LMS provided by the university or the blogs we had we needed a community as well. Today, students in Oslo University keep taking benefits from The Littera Project. 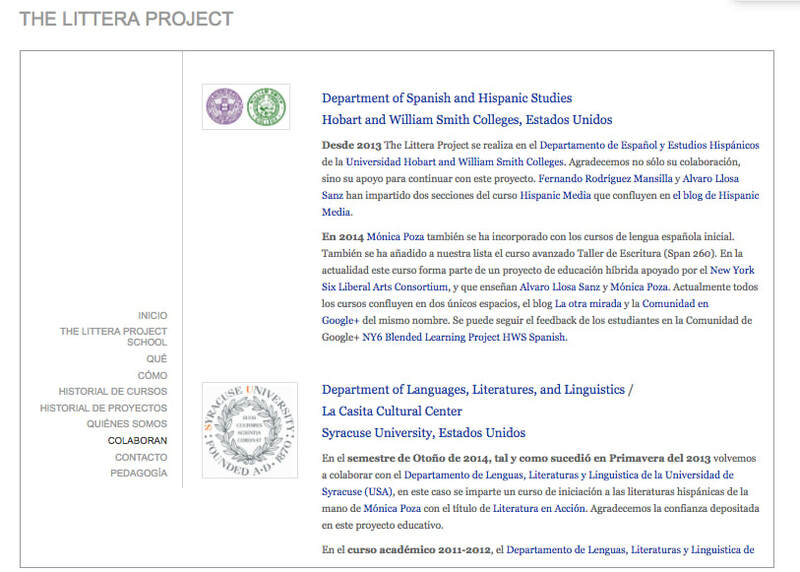 Currently, I collaborate with Literalia, a project developed by Prof. Alvaro Llosa Sanz in UiO. Ana Belén Mañas Gómez and Ingerid Grønnevik Flåskjer are the creators of this list of enriched literary texts in Spanish, using Scalar, the software developed by University of Southern California. The texts are read by undergraduate students in UiO and Høgskolen i Østfold. More colleges from the USA have expressed their interest on it. I am a supervisor in this very-well-rated-by-students initiative.